Lower flow at most dams is allowing the U.S. Army Corps of Engineers to begin to return to court-ordered spring spill up to state mandated total dissolved gas levels, known as gas caps -- 120 percent TDG in tailraces and 115 percent TDG in the downstream dam's forebay. Higher than normal flows, spill and TDG that impacted the spill cap operations in May are returning to lower levels, according to Dan Turner of the Corps' River Control Center, speaking at the interagency Technical Management Team meeting Wednesday, June 6. With lower stream flows at Snake River dams, the Corps is again managing to spill targets. It has now hit that target at Lower Granite Dam (31,000 cubic feet per second) since June 3 and has kept TDG levels at or slightly under gas cap levels since June 1. TDG in Lower Granite's tailwater reached 126 percent May 26 and 27. The Little Goose Forebay hit 120 percent May 28 and 29. "LoMo is in transition," Turner said, noting that the Lower Monumental Dam spill target has yet to be hit, but TDG levels were within the gas cap June 6. 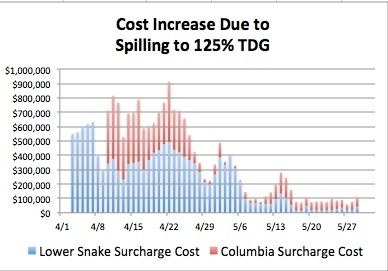 Tailwater TDG a LoMo hit 128 percent May 23 and the downstream forebay at Ice Harbor Dam hit 123 percent May 28 and 29. Ice Harbor Dam, the lower dam on the Snake River, has for the most part met its spill target of 80 kcfs since June 3, but the forebay at the next downstream dam, McNary, on the Columbia River continues to exceed the 115 percent TDG cap. TDG at Ice Harbor's tailwater hit 130 percent May 27 and the forebay at McNary hit 125 percent May 23 and 24. Although flows are also dropping in the Columbia River, involuntary spill is continuing and TDG at all four lower Columbia River dams -- McNary, John Day, The Dalles and Bonneville dams -- continue to exceed water quality standards set by the states. Water supply forecasts remain high with an April -- August forecast at The Dalles Dam of 105,908,000 acre feet, which is 121 percent of the 30-year average (1981 -- 2010). -- Lower Granite Dam on the lower Snake River, April -- July, 23.878 MAF, 120 percent of the 30-year average. -- Libby Dam on the Kootenai River, April -- August, 7.213 MAF, 122 percent of the 30-year average. -- Dworshak Dam on the North Fork Clearwater River, April -- July, 2.966 MAF, 122 percent of the 30-year average. -- Grand Coulee Dam on the upper Columbia River, April -- August, 69.008 MAF, 122 percent of the 30-year average. -- Albeni Falls Dam on the Pend Oreille River, April -- August, 17,692 MAF, 143 percent of the 30-year average.